Book and a Beverage: Tara from The Librarian Who Doesn't Say Shhh! Book and a Beverage  – Tara from The Librarian Who Doesn’t Say Shhh! Give a big welcome to Tara from The Librarian Who Doesn’t Say Shhh! Name & Blog Name: Tara @ The Librarian Who Doesn’t Say Shhh! Tell us a little about your blog! Well, my blog title is misleading. I used to be a librarian (and, before that, a middle school teacher), but now I am working on my Ph.D in education. I review everything I read, post on bookish things, and share my experiences as a doctoral student. Eventually my goal is to become the most amazing YA lit professor on the planet. My blog is my documentation of that journey. What’s been your favorite post you’ve written so far? (Link us up!) My favorite post right now is one I just wrote and published called What’s It’s Like To Study YA Lit for Your Ph.D. It sounds like it would be really fun to do your doctoral studies and dissertation on young adult literature, because some people assume I just read YA books all day. It’s actually quite a bit more complicated than that. Writing that post really made me think about all that I do and how it all comes together! Got anything special coming up we should know about? Nothing terribly crazy, but I have written and scheduled some great discussion posts (I like to think of them as “articles”) this spring. I’ve documented my blogging process, including my various calendars and lists and notebooks that I use to organize everything, for one post that will talk about the work that goes into keeping a daily blog running. I look forward to seeing how other people share about their own process with that post! Where did it come from? (Library, purchased, publisher, etc) I picked up the ARC at the National Council of Teachers of English conference this fall. Any special reason you chose to feature this book? E. Lockhart is my favorite author, and I’ve been super-excited about this book since I first heard about it. I’ve been holding off until just the right moment to start because I know it will be delicious and I want to savor every minute. So far, it’s living up to its expectations. No lie! What’s important that we should know about this book? Would you recommend it? E. Lockhart has instructed us to lie about this book. So…do you really trust what I’m going to say? I was told to go into it blind and just enjoy the ride, and at this point I would agree that that’s the best way to approach this novel. It comes out in May, but I’m pretty sure I saw it listed on NetGalley and/or Edelweiss for any bloggers who want an early copy! Whatcha drinking? Starbucks Sumatra coffee, made with freshly ground beans in my new french press! With lots of cream and sugar, of course. What’s your favorite thing to drink while reading? Coffee. Any and every kind of coffee. I’m partial to skinny mochas with a shot of raspberry at the moment. Favorite beverage of all time. Go! Definitely the Starbucks Frappucinos that come in the glass bottles. I don’t know what is so addictive about those stupid (and by stupid, I mean stupid delicious) things, but I kind of have an addiction to them. It’s a problem. What are your top three books you would recommend to other people? I am an LGBT blogger, so books with LGBT characters are very dear to me. I’m always recommending Benjamin Alire Saenz’s Aristotle and Dante Discover the Secrets of the Universe because I just adored the relationship in that novel. I also felt David Levithan’s Every Day was also such a unique book in how he examines a character without a gender. I also like to recommend Eleanor & Park because I think everyone can relate the awkwardness of first love. My favorite genre is dystopian, but clearly I love recommending contemporary novels! What’s your proudest blogging/reading/writing moment? My proudest blogging moment was probably when I was Freshly Pressed on WordPress one day in 2011. It really skyrocket my blog’s popularity and brought me some great readers. Plus I got over 5,000 hits in a single day AND hundreds of comments. Goodness. Anything else you’d like to share? I’ve just fallen in love with Tumblr, and I think my dissertation might be about how readers use Tumblr to talk about books. So if you have a Tumblr, I’d love to gain some new Tumblr friends! Thanks, Tara!! So happy to have you on Book and a Beverage! Eleanor & Park will always hold a special place in my heart too and I can’t wait to read We Were Liars! I hope you enjoyed getting to know Tara! You can find out more about Tara at her blog, The Librarian Who Doesn’t Say Shhh!, on Twitter, Tumblr, Pinterest, and Goodreads! This entry was posted in Book and a Beverage, Books and tagged Blogger Feature, Blogger Spotlight, Book and a Beverage, Books, Feature on January 30, 2014 by Brittany. Tara’s blog is one of my favorites and I’m happy to see her featured here! 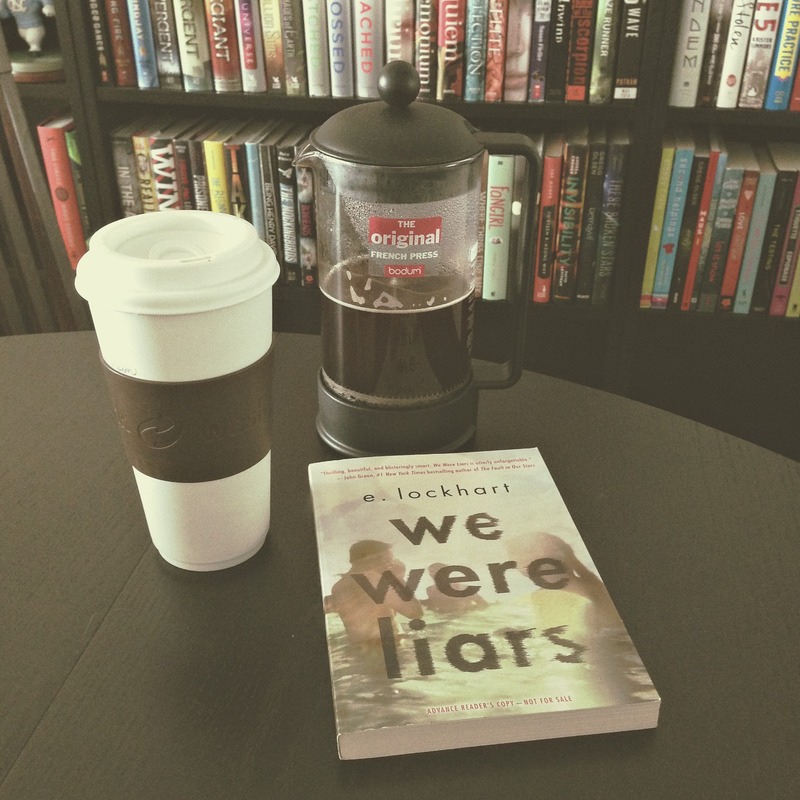 Raspberry mocha coffee sounds delish & especially paired with We Were Liars! Every Day and E&P are two of my faves too. Thanks for the fun post, ladies! Hi Tara! I think it’s so awesome that you’re doing your dissertation on YA lit!! That is seriously so cool!